Reading The Ludwig Conspiracy, an historical novel by Oliver Pötzsch, opens up dark passageways into the side notes of history. The book itself is a fast-paced thriller with unexpected and persistent villains, both past and present. Published in 2011, eight years after Dan Brown’s The Da Vinci Code, Pötzsch’s book also draws on secret codes and byzantine intrigues and superficially seems to ride Dan Brown’s wave. 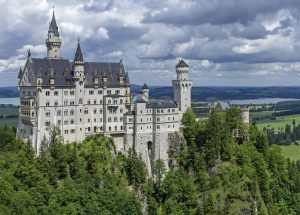 You know King Ludwig II of Bavaria as “Mad King Ludwig,” who commissioned the building of Schloss Neuschwanstein, famous as the Disney World castle. 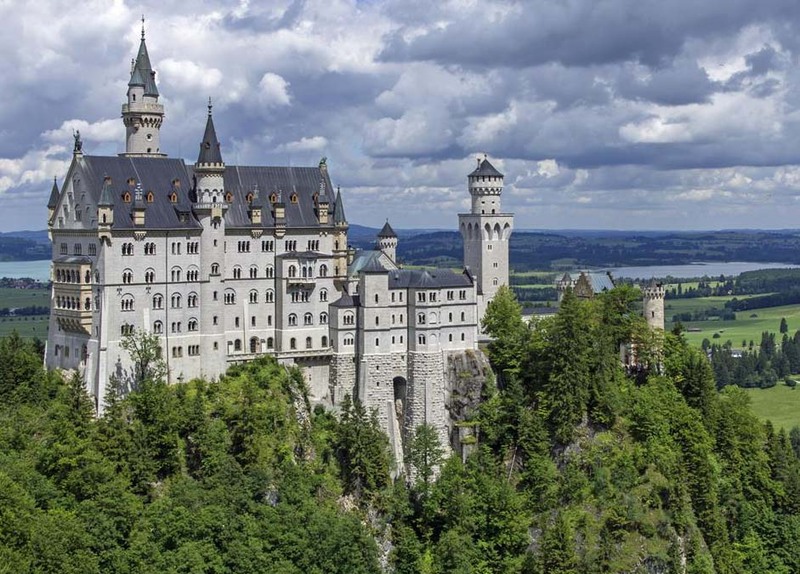 He also built Schloss Linderhog and an imitation Versailles known as Herrenschiemsee. Ludwig was born in 1845 and crowned king in 1864. He was a Roman Catholic who struggled with his homosexuality and he was a patron of the composer Richard Wagner. In June 1886, his body and that of his psychiatrist were found drowned in a Bavarian lake. An investigating committee issued the official statement, concluding that the king, who had been deposed three days earlier on the grounds of insanity, had strangled his doctor and then committed suicide. His death remains a mystery. The Ludwig Conspiracy begins in 2010 as Professor Paul Liebermann is tortured to reveal where he has hidden an old journal. The professor dies without revealing that he slipped it onto a shelf in a bookstore owned by Steven Lukas, seller of antiquarian books. Steven finds the journal, but it is written in an indecipherable shorthand. It seems to be the journal of Theodor Marot, assistant to the royal physician, Dr. Max Schleiss von Loewenfeld. Sara Lengfeld, the professor’s niece, turns up at the book shop, searching for the book. Then the shop is vandalized and Steven finds a murdered man on the floor. Sara convinces Steven to run for his life. As Steven works to decipher the journal with clues to be found at the Ludwig castles, he and Sara are pursued by strange “cowled men” and murderers, all wanting the journal. Alternating chapters revert to the past, telling the story of King Ludwig from the viewpoint of Theodor Marot, writer of the journal. He witnesses the growing conspiracy to depose King Ludwig while remaining a true friend to the king. As the author explains, there really were and apparently are men disguised by cowls who belong to a Bavarian secret society that campaigns even now to clarify what its members, regard as the murder of King Ludwig. Their legend goes back to the funeral of Frederick Barbarossa, when cowled knights in black habits are said to have followed the funeral procession. Cowled Men were also present at the funeral of Ludwig II in Munich. Go to http://www.guglmann.de for more information. The author Oliver Pötzsch, is also worth looking up. He’s German, descended from a long line of hangmen who lived in a small part of Bavaria near the Alps. Using research into his background, he also wrote The Hangman’s Daughter, a thriller set in 17th century Bavaria. Hangmen, I learn reading an interview with Pötzsch, had a great deal of knowledge about herbs and healing, so they were also the local doctors in the community. When executions were outlawed, his ancestors turned to medicine and became doctors. In fact, everyone else in his family is a doctor, but he became a writer instead.